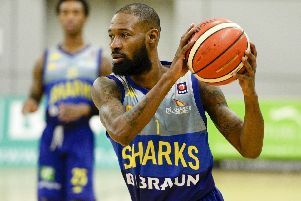 Chris Alexander scored a season’s best of 31 points as DBL Sharks Sheffield returned to winning ways with a 88-81 triumph over Cheshire Phoenix at the EIS. The Sharks had lost back-to-back games against Leicester Riders in both league and cup but bounced back in convincing fashion to keep their BBL play-off hopes high. BBL Cup winners Cheshire started quickly with a 5-0 run but the Sharks had their noses in front at the end of a high-scoring first quarter, leading 30-26. Sheffield opened up an eight point lead by half time with Alexander moving onto 19 points for the game to help them to a 49-41 advantage. Alexander bagged back-to-back three pointers on an personal eight point run for the side. He finished the game with his best three pointer tally of the season with five successful out of ten attempts. Phoenix cut the lead down to just one point with a 9-2 run at the start of the second half before a huge three pointer from Zack Gachette gave the Sharks some breathing space again. But Cheshire did manage to take the lead for the first time since the opening moments of the match as they moved to 55-54 score. The Sharks had the better of the remaining time in the third quarter and finished the period with a 68-63 lead. Phoenix got within three early in the final quarter but a 10-2 run from Sheffield proved decisive and kept them comfortably in front until the final buzzer. The Sharks will be back in action on Sunday week away in Glasgow. Prior to the Sharks’ match, Sheffield Hatters earned a 79-60 win over Oaklands with Jennifer Ashton netting 21 points.